Do your access ports, inspection doors and manways meet OSHA’s regulations? If you need help making your facility compliant with OSHA standards, contact KC Supply Co. KC Supply is the largest stocking distributor of Knappco and Civacon access doors in the United States. We offer pressure-rated, non-pressure-rated and pressure-relieving options. KC Supply also stocks Knappco and Civacon access door screens to prevent unauthorized entry. Knappco specializes in products for access to petroleum, chemical and dry bulk cargo tanks and conveying equipment. These include: access ports, manways, weld rings, hatches, fill covers, swing check valves, pressure vacuum hatches, pressure relief valves, bottom loading equipment, delivery elbows, overfill detection devices and vapor recovery adaptors. For Knappco products, you can depend on KC Supply Co. We stock the complete line of Knappco products. We also are the largest Knappco stocking distributor and have been a Knappco distribution partner for decades. If you need a product immediately, KC Supply offers same-day shipment options on most items. In addition, KC Supply is Knappco’s only authorized, factory-trained repair center in the United States. Contact KC Supply today to order Knappco and Civacon access doors. We also can answer questions about OSHA regulations and about which products meet those regulations. KC Supply Co. is your trusted source for conveying and elevating equipment plus safety supplies. The Greibrok brothers were breaking up rotten corn in a Glenville, Minn., bin earlier this month when disaster struck. David Greibok became stuck and knew he was in trouble. Glenville Fire Chief Matt Webb and his father, Wes, were close by and first on the scene to help. They brought in rescue equipment to help free David. They were joined by more firefighters, who used a grain rescue tube and an auger to relieve some of the pressure and remove the corn. Firefighters arrived on the scene just before 10 am that day and freed David Greibrok just before noon. Webb said Greibok is safe thanks to a great team effort and the grain entrapment rescue devices they had on hand. According to Jeff Lavery, owner of KC Supply Co., the rescue tube is designed to act as a barrier to allow the pressure of the grain from being exerted on the trapped person. Once the tube is assembled around him, the grain is removed from inside the tube, allowing him to be gradually unburied. The steps on the inside of the tube allow first responders to provide first aid and other rescue activities – without standing on the person who is trapped. Because the fire department had the right rescue equipment on hand, David Greibok’s story had a happy ending. KC Supply Co. supplied the fire department with the yellow rescue tube used in the rescue and offers a patented, red version of the rescue auger, Lavery said. The KC Supply Red Rescue Auger is a one-of-a-kind tool engineered specifically for grain entrapment rescues. KC Supply carries them in stock. Every second counts in a rescue operation and being prepared for an emergency can mean the difference between life and death. If you don’t have the right grain entrapment rescue devices at the ready, you can find what you need today at KC Supply. KC Supply offers tubes, augers, and other critical rescue equipment. Contact KC Supply Co. today for all your grain entrapment rescue device needs. Selecting the right conveying and elevating buckets for agricultural use can be a daunting task. Quality and reliability are critical. You can trust Maxi-Lift Inc. for both. With more than 45 years of experience in the business, you can trust Maxi-Lift conveying and elevating buckets for your agricultural and industrial needs. Maxi-Lift’s buckets are available in Tiger-CC and HD-STAX models. Suitable for crushing operations and feed facilities, the Tiger-CC series offers 21 sizes ranging from 10 x 7 to 28 x 10 in polyethylene, nylon and urethane materials. All Tiger-Tuff buckets, whether the traditional design or the CC style, are made for high volume/throughput applications that take a toll on wear components in an elevator. With millions sold worldwide, the largest grain, feed, processing, fertilizer and ethanol companies use Tigers. Featuring a tapered design to allow for deep stacking of buckets, HD-STAX buckets are available in sizes ranging from 4 x 3 to 18 x 8. HD-STAX are used in grain and feed applications. Another critical consideration is bucket material. Maxi-Lift makes 40 sizes of agricultural urethane buckets. Urethane buckets are the most abrasion-resistant, non-metallic buckets available. In addition, they are pliable, which allows them to give a little under impact. This virtually eliminates the cracking experienced with some polyethylene buckets, making them ideal for feed applications. KC Supply Co. offers a wide variety of Maxi-Lift conveying and elevating buckets to meet your every agricultural need. Maxi-Lift is the largest elevator bucket manufacturer in the world. When it comes to choosing or replacing conveying and elevating buckets for your agricultural needs, count on KC Supply Co. for advice and help. For more than 25 years, KC Supply Co. has been the leader in moving your agricultural equipment from point A to point B. 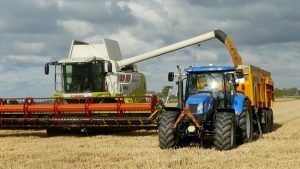 We are your trusted experts when it comes to selecting agricultural conveying and elevating equipment. We offer a complete line of Maxi-Lift conveying and elevating buckets, from complete units to replacement parts. Call us today at 800.527.8775. Grain silos are hazardous places to work and so implementing the right agricultural and industrial safety equipment is critical. 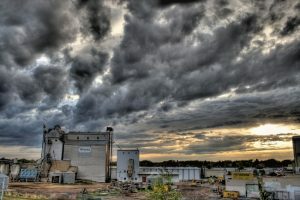 Last year, for example, there were 29 grain entrapment incidents – about 21 percent more cases than the 24 incidents in 2015, according to Purdue University’s annual survey of grain handling accidents. Eighteen people died from entrapment in 2016, up from 14 the previous year, the survey found. Although entrapment numbers increased in 2016, the five-year average actually declined slightly, from 30.2 in 2015 to 29.4 in 2016, according to the report. The recent high for entrapment cases and deaths was in 2010, when 31 people died and 59 incidents occurred, past Purdue reports revealed. But entrapments aren’t the only hazard in grain silos. In 2016, Purdue researchers found another 42 grain-related incidents that resulted in the deaths of 22 people from incidents including entanglement with machinery, asphyxiation and falls. Purdue found that more than 900 cases of grain engulfment have been reported in the past 50 years, with a fatality rate of 62 percent. The Occupational Safety and Health Administration’s (OSHA) grain handling rule (29 C.F.R. 1910.272) generally defines silos as confined spaces, requiring workers lowered into a silo to be tethered an escape system and to have an observer watching. The rule also says people shouldn’t enter a silo if machinery is running and it is possible to snag a worker’s foot or arm. 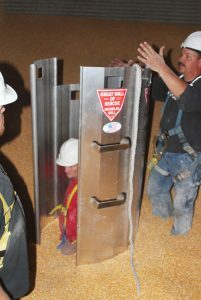 Do you have the proper safety equipment in place to protect your workers when they enter a silo? KC Supply Co. can help you find agricultural and industrial safety equipment that fits your work environment needs. To be prepared for a life-threatening accident or situation, KC Supply Co. offers a solution to reduce considerably the time required to remove grain. Every second counts during a rescue, so the KC Supply Red Rescue Auger is a one-of-a-kind tool engineered specifically to aid in grain engulfment rescues. Another solution from KC Supply Co. is the Great Stepped Silver Wall for Grain Entrapment Rescue V4.0. It combines the strengths of two of the best designs to offer the ultimate adaptable entrapment rescue device. External steps provide leverage for inserting panels, while internal steps allow first responders to access the trapped worker and provide first aid. There is nothing more critical than keeping your employees safe. KC Supply Co. offers an expansive collection of agricultural and industrial safety equipment. We carry everything you need to ensure a safe working environment, including fall protection equipment, gas monitors, grain entrapment rescue devices, PPE, respirators, proper lighting, signs, locks, and emergency and rescue equipment. Call KC Supply Co. today and ask us what products you need to keep your workers safe. Are You in Compliance with OSHA’s Slip, Trip and Fall Revisions? According to the Bureau of Labor Statistics, slips, trips and falls cause the majority of general industry workplace accidents and cost employers billions of dollars each year in lost productivity and business. The Occupational Health and Safety Administration’s (OSHA) statistics show that about 20% of all disabling occupational injuries result from falls (202,066 serious accidents a year). For these reasons, OSHA revised its slips, trips and falls regulation under Subpart D, “Walking-Working Surfaces.” The requirements apply to all general industry workplaces and all walking and work surfaces, including but not limited to: floors, aisles, ladders, roofs, ramps, stairways, scaffolds and elevated work surfaces and walkways. Provide training that enables employees to recognize the hazards of falling and the procedures to be followed to minimize these hazards. OSHA expects the requirements to affect seven million employers and 112 million employees. The revisions will prevent 29 fatalities and 5,842 injuries each year, according to OSHA’s estimates. OSHA believes that the new requirements give employers the necessary flexibility to decide which fall protection method or system works best for the work operation. General industry employers can now use guardrails and handrails, covers, personal fall protection, designated areas, safety net systems and safety gates that meet OSHA regulations. For employees, OSHA said these options will help provide more effective and necessary protection from falls. Are you in compliance with the new rules? If not, or if you’re not sure, call the experts at KC Supply Co. at 800.527.8775. KC Supply Co. can help you select the appropriate safety gates that meet OSHA regulations for your workplace needs, for ladderway openings, stairway openings, equipment access ladders, scaffolding, mezzanines, working platforms and more. KC Supply Co. is your source for safety gates that meet OSHA regulations and other critical workplace safety gear. For more about OSHA’s revisions to Subpart D, visit www.osha.gov/walking-working-surfaces. KC Supplicicles 2016 – Making A Difference One Polar Plunge At A Time! KC Supply has once again teamed up with the Special Olympics of Kansas in hopes of raising money through the Polar Plunge and Strut. An event, unlike any other, has participants prove their bravery as they take a bone-chilling plunge with a warm giving heart into the Shawnee Mission Park Pond this January 30th. Warm tents will line the sides as onlookers enjoy the humorous good cause which will raise money for an incredible organization, the Special Olympics Kansas (SOKS). SOKS annually serves over 5,489 children and adults with intellectual disabilities through a grass-roots network of volunteers who serve as coaches and organize local events in one or more of the 22 different sports offered throughout the year. SOKS does not receive governmental funding and is not a United Way agency, but relies solely on the generosity of individuals and corporate donors. Without hesitation, KC Supply will be showing their support by participating under the name, The KC Supplicicles this 2016 Polar Plunge.